GPU as a Service Market size was estimated at over USD 200 million in 2016 with a CAGR of over 30% from 2017 to 2024. GPU as a service is gaining momentum due to increase in number of applications and use cases on hardware, that includes deep learning, speech recognition, natural language processing, data mining, and real-time information. Moreover, these applications are going to benefit from scaling to multi-GPU servers and then to GPU server clusters with network interconnects. There is an increase in the adoption of integrated GPU, used in desktops, workstations, and notebooks, attributing to the growing need of enhanced visual content by consumers. Also, consumers are demanding more of graphics in their systems, driving the market for imaging and CAD systems. In order to meet these demands, vendors have started offering high graphics through integrated offerings, increasing the adoption of technologies that can work easily with the graphics processing unit. Thus, vendors such as NVIDIA started offering cloud services, which is forecast to propel the GPU as a service market growth. 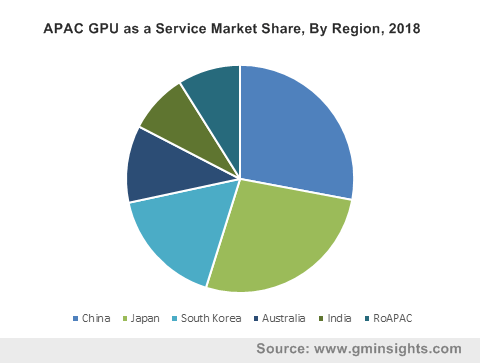 The GPU software market dominates the global revenue at around 60% of the GPU as a service market share owing to the high adoption of CAD/CAM and imaging solutions by the gaming and media sectors. Companies are now emphasizing on modeling and animation in a bid to attract more number of players in the real-estate and healthcare industry. The new technologies are emerging as novel approaches for content creation, distribution channels, and 3D modelling. The rise in demand for programmers, scientists, and designers has resulted into emergence of markets such as AI, AR and VR, and casual gaming. The arrival of these technologies has resulted in more usage of GPU, increasing the potential market for cloud computing. Organizations have also started hiring professionals that can exploit these technologies with the hardware accelerator and improve the GPU as a service market growth. The gaming industry will grow at over 40% CAGR estimation from 2017 to 2024. With the increase in the gaming audience, the use of AI and AR has gained momentum. Moreover, the technologies are helping companies in improving their brand value and it is expected that within three to four years, the GPU industry will change how the infrastructure and manufacturing industry works. Companies are actively trying to tap into the customer’s mindset and buying criteria and try to give real-time feedback data to improve business performance. The automotive and manufacturing industry is expected to experience high growth owing to increase in the 3D modelling technology used for constructing parts of the vehicle and in-depth understanding of the human body and identifying diseases. The public delivery model is estimated to dominate the GPU as a service market in 2024. Scientists and engineers need access to parallel computational power, requiring virtual machines with GPUs that are capable of high performance. The increase in speed of complex processing such as machine learning, deep learning, medical analysis, exploration, and simulations requires powerful processing that can handle complex compute-intensive workloads. However, with the changing GPU market, consumers are expected to adopt private and hybrid model due to their security features. The hybrid model is anticipated to grow due to the increase in awareness and implementation of AI and deep learning. The SaaS service model will witness high growth over the timeline due to the increase in the use of cloud model by SMEs. The model is quite attractive to healthcare and automotive industry, the growth will improve as it helps in reduce the total cost of ownership and will help professionals in understanding it better. The PaaS and IaaS market will grow as vendors such as Amazon, Google, and others are ready to invest in understanding the development of hardware on cloud platforms. 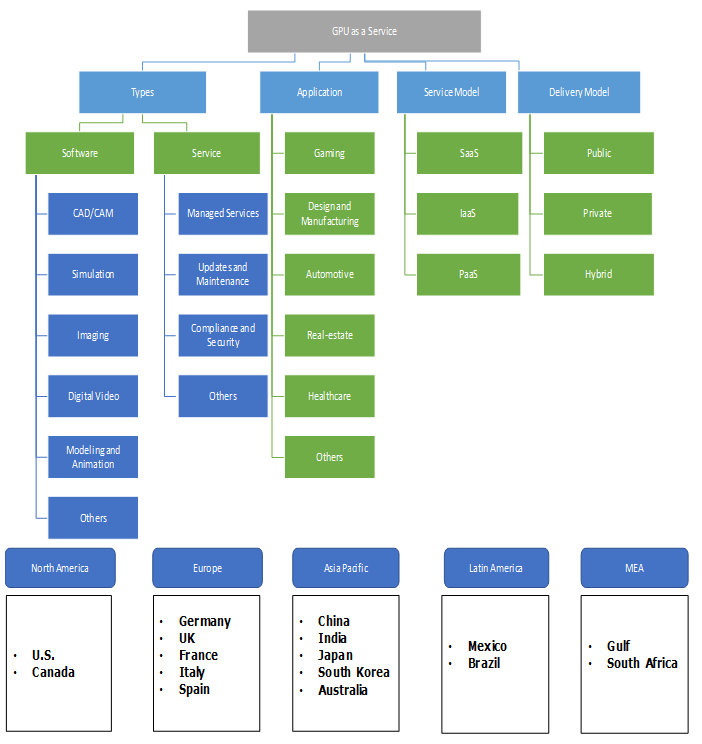 The Asia Pacific industry has witnessed an increase in gaming audience and manufacturing plants. Furthermore, the increase in the use of 3D, modeling, and simulation, in countries such as Japan, South Korea, and China for their infrastructure projects foster the market growth. Latin America will witness moderate growth over the forecast time period. The high penetration of cloud computing, increase in knowledge about technologies such as CAD and CAM, and investment budget is driving the market for the adoption of GPU as a service market. The GPU as a service market is competitive as most of the players are from the hardware space, trying to integrate with third parties to offer wide range of products. In addition, the industry is fairly attractive for CAD/CAM, and modelling providers as they have huge opportunity to capture the software market and increase their brand value. The companies in the GPU as a service market include NVIDIA, AMD, Google, Microsoft, Samsung, Amazon, IBM, Intel, ScaleMatrix, Nimbix, Peer1 Hosting, Penguin Computing, etc. Vendors have focused on innovating and developing technologies to revive the mature GPU market. Much of the focus is on the high-performance gaming industry that has become an important but niche segment. As AR and VR markets are growing, companies are trying to interact with information while engaging with their workforce supplemented by the capabilities. The GPU as a service market is forecast to remain attractive over the long term, with a double-digit growth rate year-on-year. The rack-based CPUs will power the web and cloud, GPU blades will be used for processing and will be attached to cloud hubs such as IBM, Google, and Amazon.